Jubilee is the “writing off of debt” and liberates the debtor. We were encouraged by the banks to gamble on the rising prices of housing, a wrong assumption. Without the jubilee, the current system’s best case scenario is two decades of a Japan-like economy. Worst case is the “Greatest Depression”. Capital moves from country to country like a loaded loose cannon on a ship’s deck in a rough sea firing away in an unpredictable fashion. Once the Euro begins its collapse, capital will flee to the U.S. Dollar causing its value to temporarily increase. In turn, this may put pressure on gold & silver prices denominated in $USD. $1,400 gold and $25 silver would not be out of the question. Volatility could impact prices either side of those numbers. I expect this to be temporary until that same capital perceives the next sovereign crisis to be in the U.S. At that time, the gold & silver prices are set to shoot up to epic levels. If the Far East decides to keep support levels higher by buying on the price dips at $1,600 and $29, then we may not see the earlier mentioned numbers. Ben Bernanke began Operation Twist and Wall Street voted with a down day in the market. The Fed will be unable to move the economy forward because the housing market collapse will probably take 20+ years to recover. In the meantime consumers don’t feel as wealthy with the loss of home equity value. They will not soon forget the losses in home equity and 401K’s. The only group unaffected by high unemployment was the retired worker population. With 0% interest on their investments, they will curb their spending as well. It seems that the politicians have alienated nearly every group who could spend money to stimulate the economy. This does not bode well for those in office. As fear continues to grip the various groups affected by monetary policies, consumer sentiment surveys have plunged. This translates to weak demand in non-essential purchases. We are now at risk of another systemic collapse and the Fed will do whatever possible to keep this from happening and they will throw you and I under the bus. Hyper-inflation is around the corner and there is risk of legislation to restrict gold purchases by the common man. I suspect that they will not try to control silver purchases do to its dual role as an industrial metal. Retaining purchasing power is the name of the game. A portion of our current income is set aside for the future and each of us wants our savings to retain value well into the future. Our retirement is based on that assumption. However, the economic policy makers don’t share our priorities. They live and die by today’s performance and will do whatever is necessary to carry out their policies. We can no longer rely on them to protect our interests and must think for ourselves. Most of all we must move closer to Our Heavenly Father who will guide us through these times of volatility. Ben Bernanke has indicated the Fed will keep the rates low until mid 2013. Massive redeployment of resources is needed to pull us out of this severe recession. Money needs to be spent on new industries. Workers need to be re-educated in the blue collar arena and the U.S. needs to bring production back inside the shores of the country. Outsourced creation of goods and services has now proven to be a serious mistake for this country. Global interconnectivity was dreamed up by the theorists but they failed to consider the greed associated with the redeployment of assets. In a perfect world, it would work. However, the Kingdom of GOD has not yet manifested for a true global economy to function properly. The counterfeit is now deemed a failure. Gratitude is the key to the heart. I would suggest that we expand Thanksgiving to 365 days per year and begin when we wake up in the morning. Psalm 18:49 Therefore I will give thanks to You, O LORD, among the Gentiles, And sing praises to Your name. Psalm 30:4 Sing praise to the LORD, You saints of His, And give thanks at the remembrance of His holy name. We are seeing signs of deterioration in China’s economy. Month on month, the economy is no longer growing and energy consumption is at zero growth as car sales are down 5%. He believes that there is real possibility of a domestic uprising similar to the “Arab Spring’ in Egypt, Libya and other countries. The rich are moving offshore, many in Princeton, NJ. This is an early sign of potential problems. The Chinese leaders injected over $1.1 Trillion in 2008-2009 to prop up their $4.3 Trillion economy, a 25% injection. China’s property prices are now dropping like a rock. Some builders are offering a BMW to the first 150 buyers of apartments. Ghost cities have been built and there are over 64.5 million empty apartments, enough housing for 250 million people. The property market has been in a bubble and he expects a hard landing. They are very nervous in Beijing. The leadership is spending a lot of money on domestic security forces. Food inflation in China is officially 11%, unofficially 25%. This accounts for over 40% of the average family’s budget. China’s growth model assumes a substantial export demand and if the U.S. and Europe reduces their exports due to economic contraction, China has a serious problem. In the recent past, apartment ownership was used as a store value. As problems in the economy increase, many may switch to gold as a store of value. The U.S, Europe, Japan, and China are all having economic issues. What is the probability that all will successfully deal with their issues and keep this interconnected global economy intact? MF Global bet on European Bonds, lost, and filed bankruptcy on October 31st and the brokerage accountholders got tricked! Happy Halloween! $869 million were frozen since October 31 across commodity customer accounts that contained only cash, bankruptcy trustee James Giddens has said. Gerald Celente, a customer of a subsidiary Lind-Waldock tells a different story. Lind-Waldock operated as a full-service futures brokerage firm primarily serving individual traders, or as known in the industry, “retail” clients. Celente had bought a gold futures contract and had sufficient funds to take possession of the gold next month. The futures contract locks in the price of gold to be settled at a specific point in the future. Most traders close their position before expiration and settle for cash thus producing a profit or loss depending on the price the day of settlement. Celente put enough money (over $100,000) in his account to actually take delivery of the gold at expiration of the contract. Celente received a phone call last week indicating that the Chicago Mercantile Exchange (CME) who handles the commodities trading exchange, “and others”, had confiscated his cash in a totally separate account without his knowledge or approval AND he was receiving a “margin call”. The broker will initiate a margin call when there is not enough money in the account to cover the futures contract. Celente in his own words suffered a major loss. The essence of this story is that the rule of law is being broken and anybody with bank accounts, brokerage accounts, safe deposit boxes, etc., may not have the safety net they think they have. If an entity can extract your funds without your consent or knowledge then you no longer have the safety of Law to insure your wealth won’t be confiscated. This fundamental right of Americans is why the rest of the globe wants to live here. Other countries have dismantled the rights of the individual and stolen their wealth by various means. The global financial system is based on the rule of law. How can we conduct business without a consistent set of rules? What if Our Heavenly Father decided to change the law of gravity from time to time? Chaos went ensue. That may happen soon in the global financial markets if this action is a true indication. Who is in the middle of this? MF’s chief executive, former New Jersey governor and Goldman Sachs head Jon Corzine. The European crisis is moving toward the extraction of wealth from bondholders and banks who bet on European bonds. If the banks take a loss, who do you think will backstop them? The American taxpayer once again. Italy has replaced its Prime Minister with Mario Monti. Who is Monti? Monti is a member of the Presiderium of the Friends of Europe, a leading European think tank, and was the first chairman of Bruegel, a European think tank founded in 2005. He is the European Chairman of the Trilateral Commission, a think tank founded in 1973 by David Rockefeller. He is also a leading member of the exclusive Bilderberg Group of economists. Monti is an international adviser to Goldman Sachs and The Coca-Cola Company. Greece is in the same shape. Lucas Papademos has been selected to head up Greece. What are his ties? He has served as Senior Economist at the Federal Reserve Bank of Boston in 1980. He has been a member of the Trilateral Commission since 1998. Goldman Sachs has had a major impact on global finance. Former employees include Robert Rubin and Henry Paulson who served as United States Secretary of the Treasury under Presidents Bill Clinton and George W. Bush, respectively, as well as Mark Carney, the governor of the Bank of Canada since 2008, and Mario Draghi, governor of the European Central Bank. Gary Gensler is the chairman of the U.S. Commodity Futures Trading Commission under President Barack Obama. This agency’s job was to regulate MF Global to insure this event did not happen. Who is Gensler? Gensler spent 18 years at Goldman Sachs, making partner when he was 30, becoming head of the company’s fixed income and currency trading operations in Tokyo by the mid-’90s, and eventually the company’s co-head of finance. Why would he take a low paying position with the CFTC? The rule of law depends on fair practices and a single standard of doing business. Favoritism and preferential treatment compromise the rule of law. Celente’s explicit statements about what happened to him cause concern whether this event is a symptom of a bigger problem. The overall trend of the average guy being thrown under the bus seems to be in place. It’s going to get crowded under there! The CBS series “Sixty Minutes” aired an investigative report on members of Congress using their offices to gain information for personal financial gain, aka insider trading. Once again, it appears that there are two sets of rules: one set for those in power (the 1%) and for the rest of us (99%). Public servants are suppose to serve the “Public”, not themselves at the expense of the Public. The apparent corruption at the Federal level continues to be exposed thus evoking responses such as Occupy Wall Street, the Tea Party, and other expressions of frustration. There appears to be no reversal of abuse in sight. The attitude of entitlement continues to prevail among the elite. It has become so ingrained, Our Heavenly Father may utilize a severe, corrective procedure to cut out the corruption and lawlessness that is prevailing in the U.S., for lawlessness demands judgment. This country has had plenty of opportunity to repent but continues on the path of self destruction to the point of being out of control. The lawlessness is not isolated but has become widespread. This attitude parallels the fall of the Roman Empire in its last days. The issue is not political, it is all about sin and lawlessness. We promote Love and all its attributes, not sacrificing others for the benefit of “self”. The leaders of a country reflect the hearts of the people. I share these videos and links to inform the reader of lawless state which is global in nature. Judgment is based on the need for correction of lawlessness. We must be aware of the overall condition of mankind in order that we can understand the Divine events that will surely follow. Economic chaos is on its way and we should not be surprised or unaware but should continue to prepare for this eventuality. By focusing on Love and building relationships, we will be ready to minister to the unprepared, their lives and wellbeing may depend on our preparation. During our recent holiday in Australia, we were beat up severely with the exchange rate from US Dollars to Aussie Dollars. Arrrgh! We give them $100 for about $90,,, so much for the published rate. On top of that, prices reflect rates of yesteryear, a double whammy. $21 breakfast anybody? No refills on coffee. The decline of the U.S. dollar has been substantial without most Americans realizing the impact. In the end, gold IS the barometer and this is why there is so much energy and resources spent attempting to manipulate its price. August 15th, 2011, was the 40 year anniversary of being off the gold standard. For one generation, governments decided what money was worth, a dangerous reality. How can a small group of men have the wisdom to determine how global economics ought to work? How can they set aside self-interest motives for the benefit of mankind? They haven’t. Economic cycles require ebb and flow. Any attempt to interfere only makes the next aspect of the cycle more severe in its correction. Man’s attempt to control these natural cycles will backfire with unintended consequences. History has shown there is no escape from this reality for various empires have attempted this only to see the same outcome. Each generation thinks they are smarter than the previous assuming that more information yields greater wisdom. Not! I expect gold to hit $10,000-$12,000. Silver will rise proportionately with gold. This does not bode well for those who maintain a trust in currency but there does not appear to be any way out unless Our Heavenly Father intervenes utilizing some other method of monetary reality yet to be revealed. We could easily see a rise to $4,500 with extreme gut-wrenching volatility accompanying the move. $1,000 dips could be in the cards as we move to new highs. I agree. Cinch the saddle up tight, It’s going to be a wild ride! He takes the driver’s seat on the funicular railway… Look out below!! We finally got in a picture in Melbourne… silly rabbit! Hopefully, Peter brightened your day amongst all the turmoil. 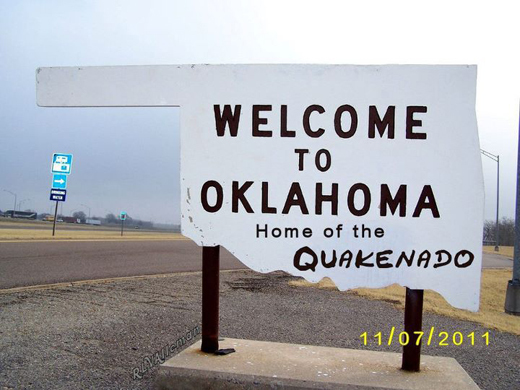 As of the writing, in the last 168 hours Oklahoma has had 26 earthquakes out of 89 earthquakes listed for the U.S. and territories. In one day, we had 4 tornadoes and a 4.7 earthquake. You are currently browsing the Servias Ministries Blog blog archives for November, 2011.